What would Sergei Vikharev have thought of his “Coppélia” if he had watched the matinee on March 23? 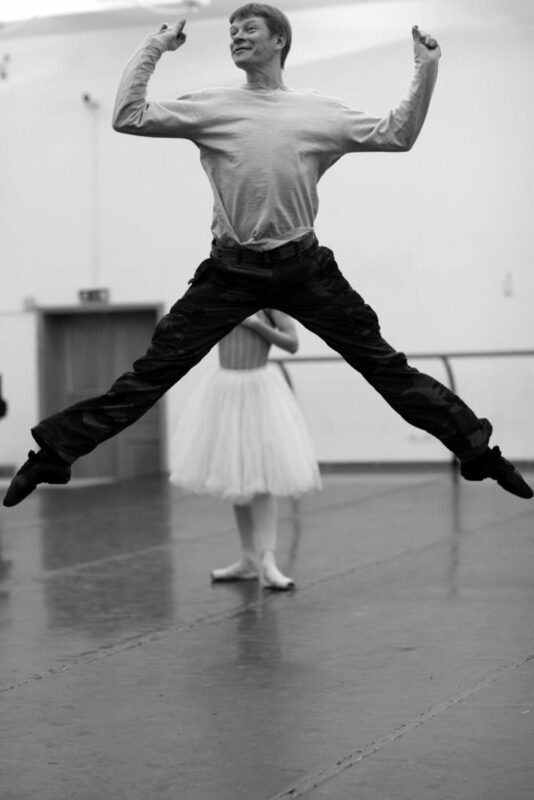 For one thing, he wouldn’t appreciate my calling the work “his”, as it is Petipa’s and his assistant Cecchetti’s 1884 choreography that Vikharev, together with ballet scholar Pavel Gershenzon, meticulously revived from Nicholas Sergeiev’s notation. Vikharev’s reconstruction premiered in 2009 with the Bolshoi Ballet with an updated revival planned for 2018/19. However, fate struck in the summer of 2017 when Vikharev, only fifty-five years old, died from an adverse reaction to anesthetic during a dental treatment. As a result, the company re-staged the 2009 version. Petipa based his St. Petersburg version on the world’s first “Coppélia” by Arthur Saint-Léon, which premiered in Paris in 1870 during a political upheaval that put an end to Napoleon III’s reign and the French monarchy. That might be the reason that “Coppélia” is a diverting comedy (peppered with satirized references to Shakespeare’s “Romeo and Juliet”) rather than a dark, spooky story like its literary source: E.T.A Hoffmann’s “The Sandman”. A young couple – perky, feisty, fun-loving Swanilda and careless gullible, immature, good-hearted, fickle Frantz – faces a lovers’ test in the temptation of the pretty Coppélia. It’s not until Swanilda unmasks Coppélia as an automaton, created by the sinister old alchemist Coppélius that Frantz sees reason and ties the knot with Swanilda. This all takes place in a small and peaceful town on the border of Galicia, with picturesque houses designed by Boris Kaminsky in 2009 and revived by Dmitry Fialkovsky in 2018. For the costume designs, Tatyana Noginova used the few old sketches by Pyotr Grigoriev and Yevgeny Ponomaryov that had survived from Petipa’s “Coppélia” and filled in the gaps with analog designs made by Adolph Charlemagne. Olga Nikulina revived Noginova’s costumes for the current run. The music is by Léo Delibes and was later described by Alexandre Benois (1870 – 1960) as “saturated with a kind of charming tenderness, with a sweetness bereft of a cloying aftertaste”. Pavel Klinichev and the Bolshoi Orchestra gave it a vibrant rendition that was variously as creamy as carefree country life, as fearful as Swanilda and the girls sneaking into Coppélius’s house, and as merry as town youth dancing and galloping in the final fair. 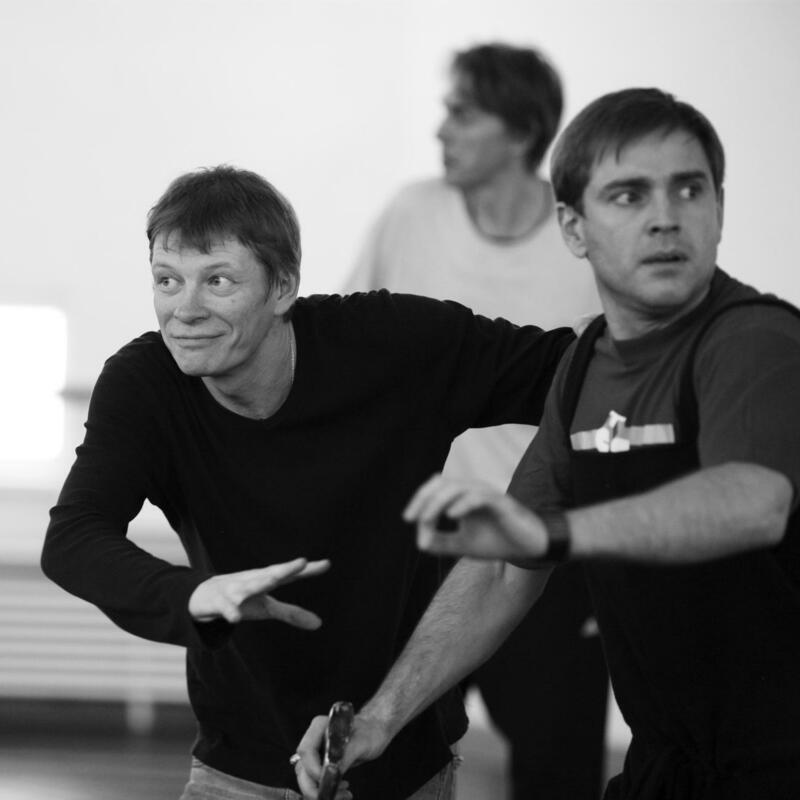 In rehearsal photos, Vikharev looks canny and witty; every glance, every gesture seems to carry a clear artistic vision. He must have been a performer to his core. 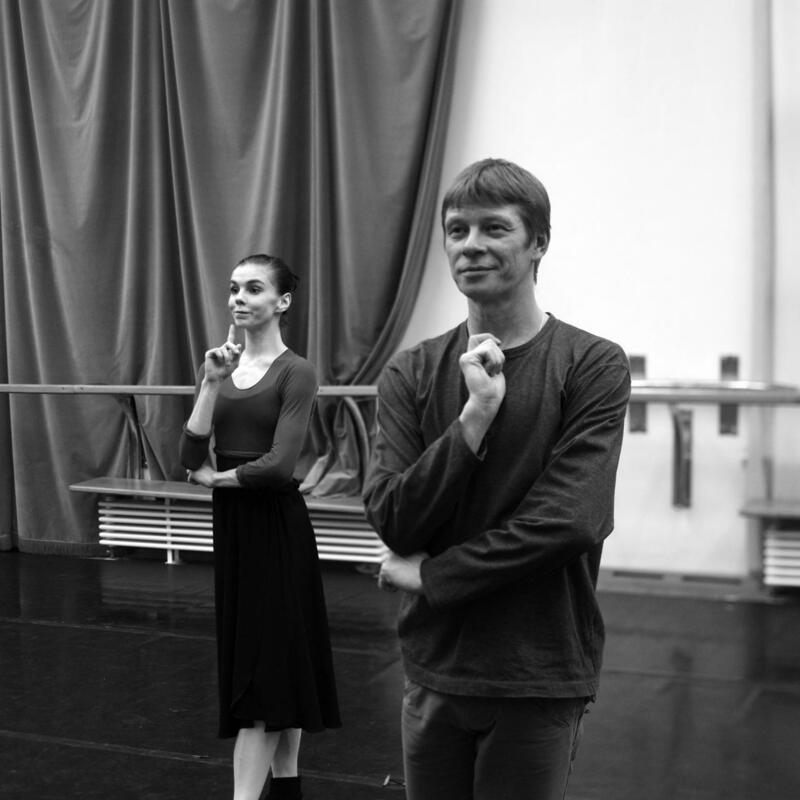 Vikharev’s and Gershenzon’s comments about the history of “Coppélia” – the successes and failures of other reproductions, the (questionable) competence of the esteemed Leningrad ballet artists in the 1970s, and the profundity of Sergeiev’s manuscript – are instructive; they both call a spade a spade. 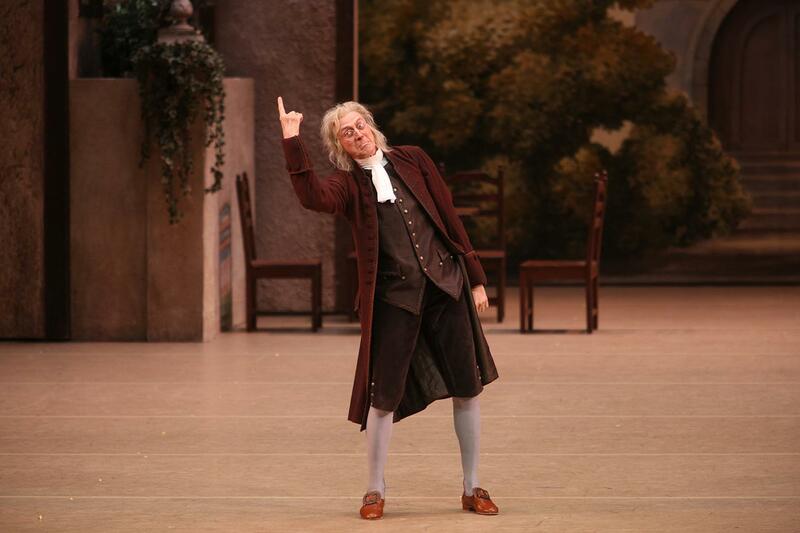 Regarding the Royal Ballet’s video of “Coppélia”, Gershenzon wonders why Swanilda is only accompanied by six girlfriends rather than eight and why the Waltz of the Hours in Act III is performed by eight dancer-hours instead of twenty-four. At the Bolshoi, six ballerinas dressed as day and night in rose, yellow, pink and black tutus, lined up under the calm eye of Chronos (Nikolay Mayorov), a personification of time. The matinee performance took place under the expert eyes of artistic director Makhar Vaziev, who stood at the back of the auditorium and scrutinized the execution of each detail alongside veteran ballet master Boris Akimov. It seemed that their presence was not only to ensure that the performance was faithful to the notation, but also to watch two young talents from the corps de ballet, Dariya Bochkova and Denis Zakharov, make their debuts as Swanilda and Frantz. Often, when young dancers give their debuts in leading classical roles, the atmosphere becomes tense as if everyone is sharing in their stage jitters. You couldn’t feel this at all at this matinee, and Bochkova and Zakharov excelled from the beginning – though it seemed as if some final touch was missing. However, one moment in Act I featured Bochkova’s Swanilda demonstrating several steps to her girlfriends, who mirrored them neatly (Alastair Macaulay explained this scene in detail in a report on a performance by New York City Ballet). It was as if a switch was suddenly flipped, and as Bochkova crossed the stage her jumps became more and more ebullient. A wave of relief rippled from the wings and the stage towards the audience. The atmosphere intensified as the energy skyrocketed. From then on also the corps’ folk dance brimmed with urgency, insistence, and power. Technique, partnering, acting, pantomime – all of these were carefully prepared and were delivered with stunning maturity – but what really matters is finding the unteachable wind that makes a performance soar. Bochkova and Zakharov both found that wind! Their rapport with the audience was remarkable, and they were rewarded with warm applause. Of Alexander Fadeyechev’s Coppélius I liked most that his dream of the ideal woman, i.e. 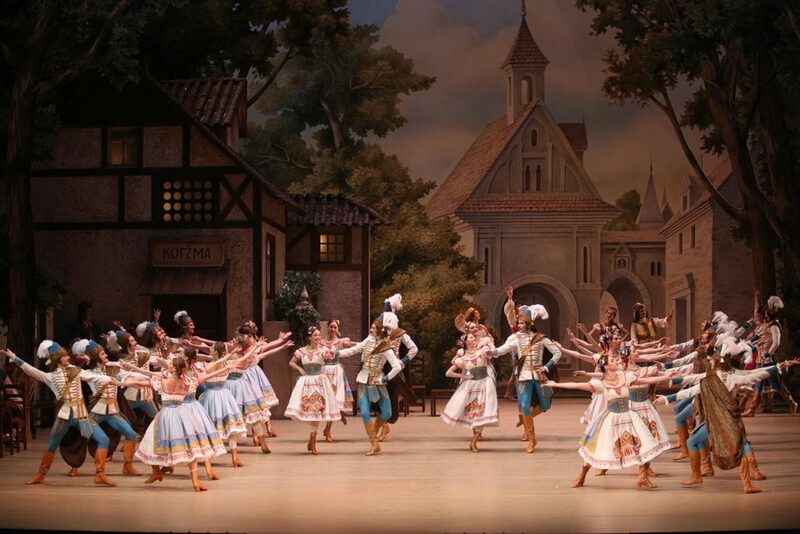 his Coppélia (Nadezhda Blagova), overwhelmed him completely when coming true. “How to get rid of the spirits that I’ve cited?” he seemed to think. The town’s burgomaster was portrayed by Yuri Ostrovsky; Nikita Elikarov’s generous Lord of Manor presented the town-folk with a reason to feast – a huge new bell – and used the festive occasion to marry Swanilda and Frantz. A parade of dance metaphors were shown at the feast, including Yulia Skvortsova as a fleet-footed, fairy-like L’Aurora, Alexandra Trikoz as the feminine La Prière announcing the hour of prayer, and Maria Mishina’s Folie jumping jauntily through the exuberant feast. 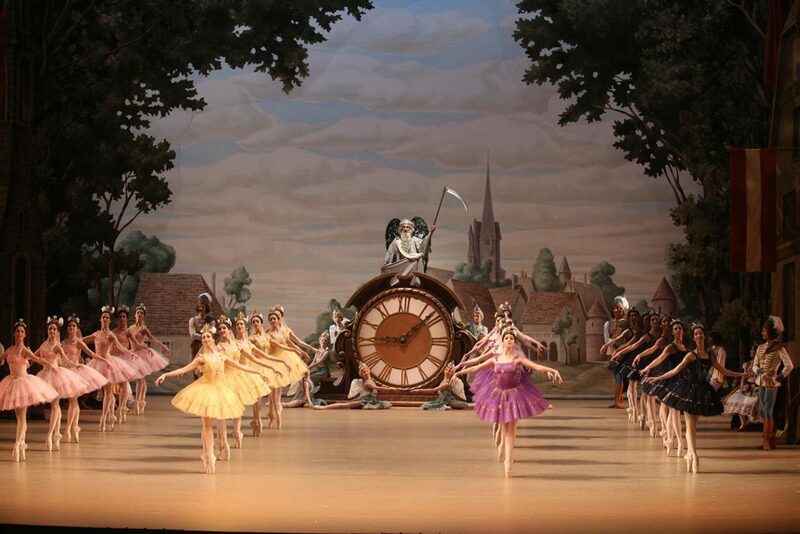 The hands of Chronos’s huge clock were set by students of the Bolshoi Ballet Academy. So – back to Sergei Vikharev. What would he have thought? I think he would have been pretty satisfied. Feedback on the articles is welcome. You are encouraged to contribute any commentary designed to spark conversation, ask questions, and/or offer constructive criticism. Please note that comments will be reviewed prior to appearing on the site. If necessary, comments may be edited or deleted to remove any inappropriate or highly inflammatory remarks.